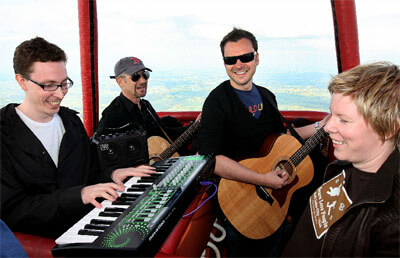 Leading dance act Above & Beyond decided to ditch their studio equipment and perform an acoustic set in a hot air balloon with Virgin Balloon Flights, to celebrate their album release. Setting off from Biggleswade in Bedfordshire, Tony, Jono, and Paavo, were joined by vocalist Zoe Johnston. The trio played 3 tracks (‘Can't Sleep’, ‘Good For Me’, and ‘No One On Earth’) to an intimate audience which included Radio 1’s Pete Tong, who was covering the event for the BBC, and a competition winner and friend who had won places on the trip. The celebratory champagne flowed after the memorable hour-long flight, piloted by Virgin Balloon Flights’ Swedish chief pilot Kenneth Karlstrom.